Bring Your 3d Models to Life! One feature of Autodesk’s Revit Architecture that I really have a lot of fun with is the ability to create fly/walkthrough animations. 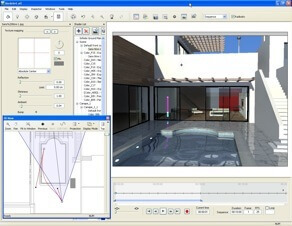 Revit’s built in Walkthrough tool allows you to create highly complex animations involving multiple key frames moving the camera path in three dimensions and is an excellent tool for exploring your models with fairly high quality output. The downside of Revit’s capabilities is that you are limited to animating your camera position. This may be okay for most situations, but what if you want a car driving down the road, or the door to open as you walk through the doorway? Well, luckily you have a lot of options. If your work flow already includes doing your rendering in 3ds Max, then you can use the powerful tools in it. Of course there are a multitude of software platforms out there, Maya, iClone, etc. and there are also some free alternatives, TrueSpace, Blender, and Anim8or. My biggest concern with all of these solutions is that they have steep learning curves or are missing Revit interoperability. For a project that comes along one every six months it’s not practical to spend weeks learning a new software program or spend thousands for a professional solution and training. Of course, the other option would be to hire an outside rendering company, which there are many affordable ones, but I like to have control over my graphics and model and want to update and modify my animations as I design. I’ve always sought to do my own renderings because I’m in control. I looked at my options a few months ago but didn’t find anything I liked. I did find one solution, Artlantis Studio, but at the time they didn’t have Revit integrations. I just found out this last week that they released a free beta plugin for RAC2009! They have a 30 day trial of their software package and I really like what I’m seeing. The interface is very intuitive and after watching the tutorials on their website I was able to create a highly complex building assemble animation. I’ll post some work later, but for now I found a reasonably priced software package with a very short learning curve, that is Revit compatible! Hi Tim — Glad to hear you are having a good experience with Artlantis! I hope you will share your work with us at your earliest convenience.